Valentine’s Day is a great day to show your appreciation for the one you love. Often, it’s through greeting cards, romantic dates, flowers, and gifts. But for some couples, the key to a loved one’s heart just might be in a few framed wedding photos around your home or a new fireplace for a cozy night. And better yet, your Valentine home improvement projects can be enjoyed for years rather than just a few moments or days. Start now on these home improvement projects to show you care for Valentine’s Day. 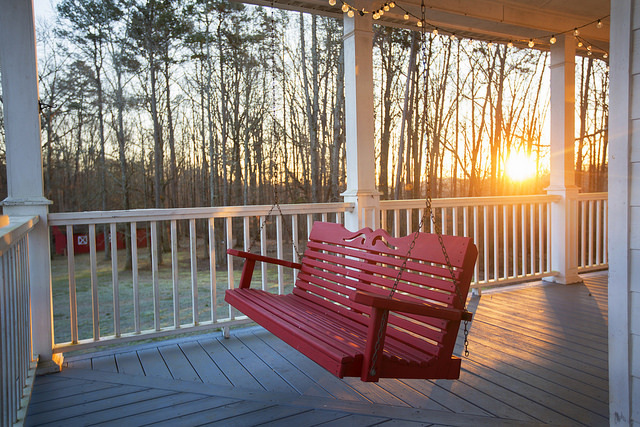 Add a couple rocking chairs to your porch: Whether you have space on your front porch or out back, make your outdoor areas more couple friendly with a pair of chairs you can enjoy together. Update your lighting: Swap out harsh lighting for something softer and more flattering. Install dimmer switches to set the mood, update outdated fixtures with a new, more romantic design, and put in new bulbs with softer light. Install a wine fridge: Love to share wine together? Enjoy an even better experience with a new wine fridge for your kitchen. Hang an outdoor swing: Get ready for the spring and summer seasons with a cozy outdoor swing or hammock that you can enjoy together. Frame your bathroom mirror: Update the look of your bathroom quickly — and remind your loved one of your hard work and caring in completing this projct every morning when they look in the mirror. Reveal your finished project with a love note on the mirror. Organize kitchen cabinets: It hardly sounds romantic, but ask any harried home chef with messy cabinets, and they’ll tell you this gesture would win their hearts over. Invest in organizational tools such as divided storage, hangers, and even drawers for cabinets, and wow your loved one with kitchen storage they’ll enjoy using. Build a piece of furniture: Nothing says love more than spending the time to create a quality handcrafted piece of furniture made with the recipient in mind. Build a bookshelf for a book lover, a jewelry hanger, or even a practical storage solution for your entryway. Hang photos on your walls: Chances are, you have plenty of photos of you and your significant other together. But do you have them framed and hung in a place of honor? Show your loved one that you care and cherish your relationship by taking the time to print, frame, and hang photos of them or the both of you together on your walls at home. Need ideas? Look for photos from your wedding day, honeymoon, favorite vacation, or early days in your relationship to make them (and you) feel nostalgic. Upgrade bath fixtures: Turn your master bathroom into a more romantic haven with updated fixtures. Add a new fixture for faucets and put in new fixtures in your shower and tub for a new, more inviting look. Then plan a big reveal with a bubble bath. Plant a flower garden: Cut flowers are a nice gesture, but in the right climate, a garden of flowers that will last for weeks or months is a more enduring reminder of your love. Or, plant rose bushes for something more permanent. Plus, you can select flowers from your garden or rose bush for a home made bouquet. Buy new bedding: Refresh your bedroom and make your bed more enticing with fresh, new sheets. Take it a step further with a new bedspread or even a new headboard. Put in a fireplace: Nothing says cozy and romantic like a fireplace at home. But even if your home doesn’t already have one, it is possible to get one installed. Freestanding units can be purchased and enjoyed within moments, and local installers can add one to your home as well. Rather take it outside? An outdoor fire pit is romantic, too. Carve out a ladies’ retreat or man cave: Have a space in your home that you’re not really using? Clear out the junk and make it a place for your loved one to enjoy instead. Add furniture and touches that you know they’ll enjoy, such as wall paint in their favorite color, or the perfect storage solution for their favorite collection. Just fix it: Practically every couple has a project or two on their honey do list that gets overlooked. Think about the project that your loved one has been wanting to see done and make it happen.